I’m a romance author. I have always loved love. I have always been drawn to the strong hero falling for the virtuous woman. I relive that moment every time I delve into my fictional world and write each new book. In the front of most books I sign, unless there’s a specific verse that I have assigned to a specific story, I write, “Live a life of love.” Because, universally, that’s what my books are about. But, beyond the romantic love of my stories, I love the message that what God wants from us, what is a sweet smelling sacrifice for God — is to live a life of love. Love your neighbor as yourself. Love the Lord God your Father with all of your heart, mind, and strength. Love your spouse. Live a life of love. My husband send me this coffee cup, mail order, when he was in Afghanistan. 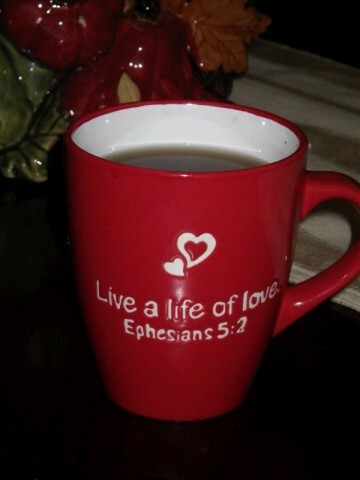 As I approached my writing career as a Christian fiction author, I chose Ephesians 5:2 as my life verse. Live a life of love. I’m a featured author at the Romancing the Smokies event this weekend in Knoxville, Tennessee. One of the things I had to do was to design and decorate my table where people have bought a ticket to sit with me and enjoy lunch. I’m not even going to pretend to know anything about decorating a table. I have to admit, this was entirely intimidating to me. 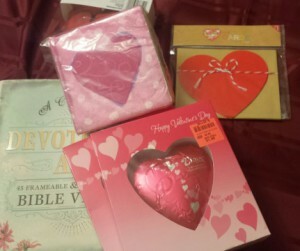 Until I was standing in a local discount store and saw a massive display of Valentine deals. “Love!” I thought. It’s my life verse! What else would I use to decorate my table? So, my guests are going to get a deluge of hearts – complete with a massive Dove chocolate heart and rose petals – to symbolize the verse by which I try to live my life: Live a life of love. Answer and you will be entered to win an autographed paperback of my entire Jewel Series – four books in one. If you already have that one, you can pick from any of my other books in paperback. International entries are always accepted by me. Entries close Friday, March 18th at 5pm est. Good luck with you production schedule! Thank you! I love that verse. I can do all things through Christ who strengthens me. Phil. 4:13 NKJV. Lovely mug. Best wishes with the production schedule. Good choice of decorations. I always repeat that verse to myself as I launch into something new — especially when I feel intimidated by the prospect! Thanks for your post. Best wishes on your production schedule. Besides Proverbs 3: 5 – 6, which my parents gave to me as my life verses; my husband and I choose I John 4: 7 – 11 to be our life verses for our wedding ceremony: Beloved, let us love one another, because love is from God. God’s love was revealed among us in this way: God sent his only Son into the world so that we might live through him. In this is love, not that we loved God but that he loved us and sent his Son to be the atoning sacrifice for our sins. Beloved, since God loved us so much, we also ought to love one another. We will be married 43 years in June. Enjoy your time at Romancing the Smokies in Knoxville, Tennessee. We visited my husband’s extended family there last May. The beautify of the Smokies reveal God’s glory. What a wonderful verse on which to base a marriage! I know the plans I have for you declares the Lord, plans to prosper you and not harm you, plans to give you hope and a future. Thanks for sharing your life verse with us. That is a verse my daughter lives by! Blessings on you, and you work to get caught up. I know life can get busy and I’m sorry you’re leaving us for awhile. I hope this time will be a wonderfully productive time. As for my verse, well I was going to say, Proverbs 3:5&6 but then Jill said it, then my other one is Jer. 29:11 and Colleen said that …….so I’ll say Ephesians 2:10. “We are God’s handiwork.” This verse gives me assurance that I am LOVED and created for a purpose. “We are God’s handiwork.” What a beautiful sentiment. Love it! The people around me as I grew up didn’t have life verses, but they loved the Lord! So I don’t have a life verse, but like Kimberly says, I’ve got a lot of favorites! I was much older when I first heard of it. I never chose one until I started publishing my books. I don’t really have one specific verse. I just try to love people and give as much grace as I can. I learned this verse when I was a young teenager and have had it as a life verse since then. I always repeat that verse, out loud, over and over, when I’m in a situation and feel afraid. I can do all things through Christ who strengthens me. Phil. 4:13 is my favorite verse. I love that you love love. I will miss your posts and await your return. I don’t really have a llife verse either, but I’ve loved all of these suggestions. They are all wonderful verses and things to keep in mind and cling to as we go through the trials and joys of life. My life verse is John 3:16 because that is the first verse my Daddy ever taught me. I was a little girl and we sat on the floor and read the Bible. :-) I am 55 years old now and that Scripture is still my favorite. It’s hard to pick just one verse, but I do love Romans 8:37-39.37 No, in all these things we are more than conquerors through him who loved us. For I am convinced that neither death, nor life, nor angels, nor rulers, nor things present, nor things to come, nor powers, nor height, nor depth, nor anything else in all creation, will be able to separate us from the love of God in Christ Jesus our Lord. My life verse has become our life verse since we’ve been married: 1 Corinthians 13: 4-8a “Love suffers long and is kind; love does not envy; love does not parade itself, is not puffed up; does not behave rudely, does not seek its own, is not provoked, thinks no evil; does not rejoice in iniquity, but rejoices in the truth; bears all things, believes all things, hopes all things, endures all things. Love never fails.” (NKJV). My husband demonstrates this every day & it’s a guide for our marriage :-) Really, when you think about it, it should be a guide to how we are suppose to be as Christians. Hallee, I think you are a good author and I have enjoyed your heartfelt posts! I can’t really choose a life verse. I try to trust in the Lord every day! I wish you and your family a very Happy Easter! I absolutely LOOVVEEE Ephesians 3:19! “That you may really come] to know [practically, [e]through experience for yourselves] the love of Christ, which far surpasses [f]mere knowledge [without experience]; that you may be filled [through all your being] [g]unto all the fullness of God [may have the richest measure of the divine Presence, and [h]become a body wholly filled and flooded with God Himself]”!! In the Amplified! If only we could grasp God’s unconditional love for us and what it means in our lifes we would live as truely beloveds of Christ!!!! Hallee, lovely post :) We’ll miss you! Thanks for your inspiring post. I needed to look up my favorite verse to get the reference right. I finally had time this morning. Philippians 4:4 and Philippians 4:13. 4:4 Rejoice in the Lord always. Again I say rejoice! 4:13. I can do all things though Christ who strengthens me. Life can be hard, but God can get us though joyfully!! Isaiah 43:2- promises that yes, we will walk through waters, fire, basically hard times, but God will ALWAYS be walking with us, giving us strength. This is a pretty special verse to me, and is one I keep in the the back of my mind as life presents its daily challenges. As I read that, God impressed upon that nothing that was happening to me was anything that caught Him off guard and that He is a powerful God who works wonders and that His plans are perfect plans and that He is faithful. I still had to battle through, but I had that verse to cling to when I thought I wouldn’t make it through.